If you go to market in Quebéc, your brand wouldn’t survive without French. Backed by French law, consumers expect US based companies to communicate in both English and French in the Quebéc province. If you don’t, consumers can file a complaint to the QOLF, the governing body to protect the integrity of the French language in the Quebéc region. This has many companies interested in the Francization process to avoid possible fines. Because Canada is a very attractive market for many organizations for foreign expansion, it’s easy to overlook the importance of understanding impact the French language may have on their brand in Canada. The French language doesn’t follow the same rules as English and this is often not taken into account by designers and writers who are responsible for creating the brand messaging and may be exposed to a second language for the first time. Designing and typesetting with French translations is very much a cultural shift, because it takes a mindset to switch from “what looks good in English” to “what looks good in French”. Besides what looks good, the Canadian Government publishes French Language guides specifically to standardize the way French language is being used across the board. This is why multilingual typesetting is different from design and why we often take the responsibility of typesetting of French for Canada translations, because we look for these rules. Client designers often have the desire to change the translation from what was delivered because of what they think makes the design piece look good, while in reality it is biased by their experience in English. Space before colon. Unlike French for France, French for Canada only has uses a space before the colon, not the question mark or exclamation mark. However, this space is often overruled by designers who think it shouldn’t be there. 2,54 cm instead of 2.54 cm (or 1 inch) – Also note that SI units or other symbols require a non-breaking space. So, 60 % instead of 60%. 10 $ instead of $10. Probably the biggest complaint in French is the overuse of Title Case capitalization. Only proper names are capitalized mid-sentence. Everything else should be lower cased. This includes items such as headers and titles and any call-outs. This is probably the biggest cultural shift for designers to deal with because Sentence case titles look rather understated in English. How could a title stand out in French? Perhaps “elegance over boldness” describes the approach best. Title Case sentences in French are considered “loud” and not desired. This is where we focus more on the language and make sure the translation stands out. On a side note: ALL-CAPS is appropriate in French. Although not always deemed essential, we recommend always having accented characters when using ALL-CAPS. 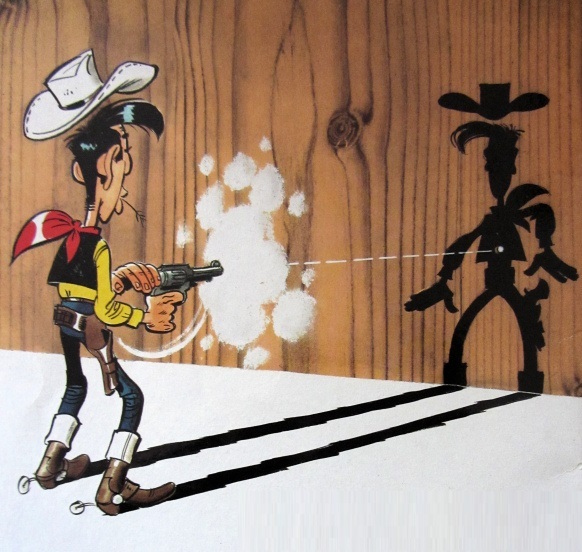 An example of font substitution. 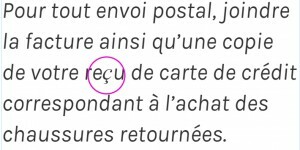 While the font clearly supports accented characters, it doesn’t support the c-cedilla (ç) character often used in French. The French language uses an extended set of characters. Without the proper character support you get font substitution wherever there is a special character, which makes the type look disjointed. We help clients to find the right fonts that have the right character support and that matches the brand image. Keep in mind that the French requires support over 134 characters. That’s about 34 more characters than in English, including accented characters in both lowercase and uppercase (á, ç, é, è, ë, î, ï, ô,û, ü,ù and ÿ), ligatures (æ and œ) and letters found in words borrowed from other languages (for example ñ). TIP: While we never encourage any designers to re-type our French translations (always copy/paste), we often see that even in-country reviewers are unable to type accents. The best way to type accented characters is to activate the international keyboard in Windows (Configuration>Keyboards) and type the accent followed by the character. For instance ‘ + e = é. Currencies, Postal Codes, Metrics, etc. are all things to consider when populating data into your designs. One final tip: One advantage in Quebéc is that paper formats are the same as the North American letter standard. However, in the rest of Canada, the common ISO 216 standard (A, B, C size) is used. Keep this in mind when creating print pieces for Canada. Brand Management for Canada is an organization-wide effort, including marketing managers, writers, designers, translators and project managers. Therefore, we encourage organizations to build and share a French for Canada language style guide that specifically addresses the impact of the French language to the company’s brand standards and messaging. 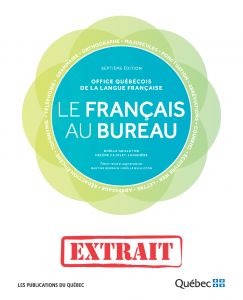 The Quebéc Government has published many articles and books about the French language standards. The Charter of French Language (OQLF) is published here. Read more about the Francization process here. Professional French translators for Canada must also adhere to approved terminology that is published by the Government of Canada in glossaries such as Termium and Le grand dictionnaire terminologique (GDT).